Early exposure to DDT linked to breast cancer later in life. Women exposed to relatively high levels of DDT prior to mid-adolescence are 5 times more likely to develop breast cancer later in life than women with lower exposures. But exposure after adolescence does not increase risk. 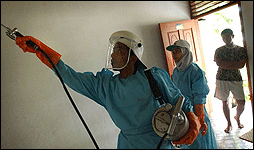 DDT continues to be used in some African countries to fight malaria. This was sanctioned in the UN Stockholm Convention on Persistent Organic Pollutants as a public health exception. This conclusion comes from a prospective study of young women's blood that was collected between 1959 and 1967 and stored by freezing, combined with an analysis of their current medical records. The median time to diagnosis of breast cancer after the sample was taken of 17 years. Many US women who were heavily exposed to DDT in childhood have not yet reached the age of 50. According to the scientists who conducted the study, "the public health significance of DDT exposure in early life may be large. Context: While Rachel Carson proposed as early as 1962 that DDT might be linked to breast cancer-- and she died of the disease herself-- most studies testing this hypothesis since then have not found an increased risk. Most of these studies have involved measuring contamination levels after cancer has been diagnosed, and then comparing these 'cases' with 'controls' matched for age. Subjects are often 50 years old, or older. A good example is the 'Long Island Breast Cancer Study' which failed to find heightened risk in response to exposure to environmental estrogens. Toxicological experiments with animals, however, have consistently suggested that early exposure-- from fetal life through puberty, especially when tissues are developing rapidly-- can be important contributors to cancer risk. Typical studies attempting to link contaminants to breast cancer risk have not been able to test this biologically-plausible hypothesis. The levels of DDT that are measurable in a 50-yr old woman are not a good index of what she experienced earlier in life. Thus when studies like the Long Island Breast Cancer Research Study conclude, using data on contamination levels in breast cancer patients, they actually aren't testing the most biologically plausible hypothesis linking breast cancer and DDT. And when they conclude that there is no link, that conclusion is only for a link between adult exposures and adult cancer, not developmental exposures and adult cancer. What did they do? Cohn et al. analyzed DDT levels in blood that had been collected between 1959 and 1967 as part of a prospective study. The samples were obtained during the period when DDT in the US was near its peak use (1959) and near the peak of DDT contamination in food (1965). The subjects all participated voluntarily. According to Cohn et al., "this is the first study to measure blood levels in young adulthood (mean age of 26 years). Prior studies collected blood when women were of middle age or much older." It is also "the first study specifically designed, a priori, to consider whether age at exposure may modify DDT effects on breast cancer." Their approach rests on the fact that because DDT was first widely introduced in the US in 1945, a woman's age in 1945 is an indicator of the youngest possible age at which a woman could have been exposed to DDT. Women who reached puberty before 1945 could not have been exposed to the pesticide during development up to puberty. Health records of the women whose blood had been stored were obtained from the California Cancer Registry and the California Vital Status Records. They assigned women to the 'case group' if they were diagnosed with breast cancer before age 50 or if they had died because of breast cancer before age 50, based on data available in early 1998. Of the women whose blood was stored, 133 met those criteria. The analysis was based on 129 cases, paired with controls matched on year of birth. The excluded cases could not be used because of insufficient serum or missing data. They measured three forms of DDT: p,p'-DDT, o,p'-DDT, and p,p'-DDE. Their main focus was on p,p'-DDT because it was the main constituent of commercial grade DDT. Prior studies have typically focused on the DDT metabolite p,p'-DDE because it is the most persistent and thus most likely to be detectable in women long after exposure. In their first test of the association between breast cancer risk and DDT exposure, they divided the women into 3 groups based on DDT exposure level, the lowest third of exposure, the middle third and the highest third (called tertials). To test their hypothesis that age of exposure influences the effect of DDT on breast cancer risk, they tested whether age in 1945 changed the strength of associations between p,p'-DDT and breast cancer. They divided the women into 4 groups depending upon their age in 1945: younger than 4 years old, 4-7, 8-13 and >13. They then estimated odds ratios for each of these groups. What did they find? They detected p,p'-DDT and p,p'-DDE in all subjects, while 65% had measureable levels of o,p'-DDT. As could be expected, the levels of p,p'-DDT and p,p'-DDE were 'considerably higher' than in samples obtained a decade or more later. First pooling women of all ages, women in the highest exposure group for p,p'-DDT were 2.9 times more likely to have breast cancer. This increased odds ratio was statistically significant (p < 0.04). Women in the highest exposure group for o,p'-DDT had a decreased risk of breast cancer (p < 0.02). o,p'-DDT is the least persistent of the DDT compounds studied; its presence indicates recent exposure. exposure, they found that women exposed before the age of 14 with the highest levels of exposure were 5.4 times more likely to have breast cancer (p < 0.01). In contrast, in women who were at least 14 by 1945, there was no relationship between exposure level and breast cancer risk. In another analysis of the same data, looking at the odds ratios of the highest tertial of exposure as a function of which of the four age groups the women were in, they found a significant inverse relationship between age and breast cancer risk. Those exposed at the youngest age had the highest breast cancer risk (p < 0.01). What does it mean? This study provides the strongest data to date linking exposure to DDT to an increased risk of breast cancer. Women under that age of 14 when DDT came into widespread DDT use in the US have a 5-fold increase in risk of breast cancer if they are within the high exposure group. No relationship is apparent for women 14 or older. This is the first epidemiological study to test for the possible effect of age of exposure as an influence on risk, a hypothesis amply justified by experiments with animals. The conclusions are strengthened by the fact that this is a prospective study designed explicitly (a priori) to test that hypothesis. The opposite effects of p,p'-DDT (increasing risk) and o,p'-DDT (decreasing risk) cannot be explained with current knowledge. As noted above, it is the least persistent DDT metabolite, which indicates recent, active exposure to DDT. Cohn et al. suggest that this may mean the strong, adverse effects of p,p'-DDT reflect longer, younger exposure because it is more persistent in the human body. They also note that p,p'-DDT levels were higher, on average, than o,p'-DDT. In their assessment of how DDT may be increasing risk, they note that p,p'-DDT is not known to be estrogenic nor anti-androgenic. Hence they don't believe that the association they find is due to estrogenic or androgenic activity. They also note that their sample size is small, even though the statistical analysis reports a strongly significant effects for p,p'-DDT. Their conclusion is carefully worded: "It is too soon to decide that DDT exposure has little public health significance for breast cancer risk. We based this conclusion on 1) the long latency of possible effects on breast cancer, 2) the large numbers of women exposed world-wide, and 3) the evidence that we provide here which suggests that women exposed when young may be most strongly affected." And they note "the public health significance of DDT exposure is potentially large." Birnbaum, LS and SE Fenton. 2003. Cancer And Developmental Exposure to Endocrine Disruptors. Environmental Health Perspectives 111:389-394. Collaborative on Health and the Environment. Breast cancer: What we know. Gammon, MD, MS Wolff, AI Neugut, SM Eng, SL Teitelbaum, JA Britton, MB Terry, B Levin, SD Stellman, GC Kabat, M Hatch, R Senie, G Berkowitz, HL Bradlow, G Garbowski, C Maffeo, P Montalvan, M Kemeny, M Citron, F Schnabel, A Schuss, S Hajdu, V Vinceguerra, N Niguidula, K Ireland and RM Santella. 2002. Environmental Toxins and Breast Cancer on Long Island. II. Organochlorine Compound Levels in Blood. Cancer Epidemiology Biomarkers & Prevention 11: 686-697. Lopez-Cervantes M, Torres-Sanchez L, Tobias A, Lopez-Carrillo L. 2004. Dichlorodiphenyldichloroethane burden and breast cancer risk: a meta-analysis of the epidemiologic evidence. Environmental Health Perspectives 112:207-214.